Every fancied renting your own private villa? Fed up with being squeezed into a tiny hotel room, studio or 1 bedroom apartment. Then look no further. Here you have the opportunity to rent a private villa on the beach-lovers paradise island of Fuerteventura, direct from the owner. Renting a villa in Fuerteventura will provide you with the space you need, together with home from home comforts. Renting a villa direct from the owner allows you to obtain up-to-date local information, holiday ideas and advice. We can provide information on the local area of Costa Caleta (also known as Caleta de Fuste), as well as other places of interest in Fuerteventura. Villa rental in Fuerteventura is becoming increasingly popular over the alternative option of a hotel or apartment. Families now recognise the space, luxury and freedom villa accommodation can offer. If you are considering renting a villa in Fuerteventura for your next holiday, please look through our website and see for yourself what we can offer. Welcome to Casa Caleta. Casa Caleta is a 3 storey Townhouse, ideally situated in the centre of Costa Caleta, in Fuerteventura. This wonderful Townhouse has a year-round heated communal swimming pool and boasts brand new beautifully furnished 3-bedroom accommodation with a superb and very large corner patio and cactus gardens. The patio area of the Townhouse is bathed in sunshine from early morning to late evening. Perfect for al fresco dining in the charming resort of Costa Caleta (Caleta de Fuste). Ideally located on the East Coast of Fuerteventura, which is the largest of the Canary Islands, Costa Caleta (Caleta de Fuste) is just 10 mins. drive from Fuerteventura airport and is centrally located to explore the delights of this beautiful island. Head north to the golden sand dunes of Corralejo, or head south to the miles of flat beaches in Jandia. The Casa Caleta Townhouse is situated on the Amuley Mar 1 complex in the centre of Costa Caleta (Caleta de Fuste). It is a brand new development of 3 and 4 bedroom Villas and Townhouses, perfect for villa holiday rental. The Villas & Townhouses all surround a fabulous communal pool, which is heated all year round and has wonderfully landscaped gardens. The exclusive complex is door entry only and is therefore very peaceful, but has the benefit of being only 5 mins. walk to the main Caleta beach and the numerous bars and restaurants the resort of Costa Caleta (Caleta de Fuste) has to offer. The Casa Caleta Townhouse in Fuerteventura is arranged over 3 floors, offering maximum living accommodation, both indoors and outdoors. 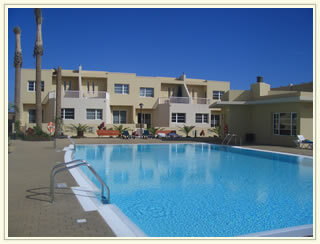 It is set in a small, peaceful holiday complex, yet within easy walking distance to the centre of town. With its location being in the Canary Islands, Spain it is blessed with fabulous year round temperatures, perfect to get away from the winter blues! Fuerteventura is the second largest of the Canary Islands in Spain, just 4 hours flying time from the UK and only 1½ hours further than mainland Spain, but with a perfect year-round climate. Fuerteventura boasts over 3000 hours of sunshine per year and at the last count 150 stunning beaches!